It’s been a long time since I watched or reviewed a Dev Anand film, and I suddenly felt in the need of a dose of Dev. Not in one of his more serious roles either, though C.I.D remains an all-time favourite; a lighter one, which would make me smile. I first thought of Tere Ghar ke Saamne, but I have watched that so frequently, I could probably say the dialogues before the actors on screen do. (I shall write that up as well, soon.) So then, which one? Nau Do Gyarah? I’m not in the mood for Kalpana Kartik, never one of my favourite actresses. As I mentally flipped through my Dev Anand movies, I realised I hadn’t watched Paying Guest in ages. There, that did it. Choice made, I made myself a cup of tea, and sat back to watch, and realised that I didn’t remember quite a bit of the story. That made it all the more interesting. When we first meet Ramesh (Dev Anand), he's in a petulant mood; he has been thrown out of his room by his exasperated landlord. (He hasn't paid the rent for six months; one can't really blame the poor guy.) As is usual, he's come to his friend's studio with all his worldly belongings. Jagat (Sajjan) is a sculptor and quite used to Ramesh, who is now claiming he wants to commit suicide. Jagat is matter-of-fact; he can't stop Ramesh from committing suicide even if he wants to - he doesn't have any money to repay Ramesh's debt. But he does have a counterfeit two-anna coin. Also, once Ramesh dies, he will be remembered (not quite fondly, perhaps) by the people whose cases he fought, and lost. The two friends, for whom this appears to be an ongoing joke, burst into laughter at their own dramatics, and Ramesh goes off to see if he can get other accommodation. He is in luck; there's a room available, but the landlord wants a character certificate from Ramesh's previous landlord. Ramesh manages to worm his way around that inconvenient fact, and is offered the downstairs portion of the house to stay in. But, he is warned, the upstairs portion belongs to a Mr Digambernath (Gyani); the latter should have no cause to complain. Not at all, says Ramesh, I'm a very loving man. That's the problem, retorts the landlord. The previous tenant was also a loving man. Digambernath chased him away. You're mistaken, says Ramesh; I meant I'm a very peace loving ('shanti-pasand') man. You don't understand, responds the landlord. The previous guy also loved 'Shanti'. Digambernath beat the living daylights out of him. If Ramesh will take his advice, he will stay far away from 'Shanti'. Ramesh has no clue what the man is blabbering about, but he has a room to stay in, and that is all he cares about. When he takes up residence, he is disturbed by noises from the room above. When he tries to stop it by tapping on his ceiling from below (ending by poking a hole in it), he is faced with a beautiful virago (Nutan) who warns him that this is a 'shareefon ka mohalla' (respectable locality). Matters deteriorate very quickly since Ramesh is flirtatious and not in the least bit apologetic, and Shanti's (she is the virago) father, who has followed her, is beginning to be apoplectic. As a result, not only does Digambernath leave the place with his family, Ramesh is thrown out by his infuriated landlord as well, for having caused him to lose his tenant of 20 years. There's also still the matter of his housing. On his way back from court, Ramesh overhears an old man refusing to rent out rooms to young men, even if they offer him double the rent. He appears to be insistent that he will only rent the room out to an elderly person. Recognising him as his virago's father, Ramesh decides to try his luck. He is soon ensconced in their house as a paying guest, and Shanti is assigned the task of looking after him. The next day, Ramesh is passing Shanti's college, and decides to see if he can spot her. Seeing that they are having the annual college debate, he seats himself comfortably on the tree outside, while Shanti and her classmate Chanchal (Shubha Khote) battle it out over what is more important for a successful marriage - love, or wealth. The poetic, sometimes heated, debate is won by Shanti who argues for love, though Public Prosecutor Dayal (Gajanan Jagirdar) who presides over the function tells Chanchal that he appreciated her point of view. When Shanti leaves college, Ramesh follows, importuning her to accept his love. Later that evening, Shanti confides in 'Mirza Saheb' that a rogue had followed her home that evening. Oh? says Mirza Saheb; he must be a true lover. Ugh, responds Shanti; I hate that man's face. (Oh, Nutan! How could you?) Ah, says Mirza Saheb, hatred is the prelude to love. (Ugh! Ugh! Ugh! But Dev... sigh!) But he promises to teach the 'loafer' a lesson he will never forget. Ramesh may have won the battle, but his downfall is just around the corner. It's Holi and Mirza Saheb's disguise does not withstand the revelry. Infuriated at the deception, Digambernath accosts him, but falls down in a faint. It's Ramesh's turn to repent. His genuine concern for Digambernath and his selfless care while the latter is ill, capture Shanti's affections, and her father's respect. A complicated rescue, and a sincere conversation later, Ramesh and Shanti are happily, gloriously, in love. So much so, Shanti gives him the money for her household expenses so he can pay her father the rent. She assumes that her father will give it back to her, and no one will be any the wiser; unfortunately, he decides to send the money to his son-in-law, Shanti's elder sister's husband. Digambernath does not want the drunkard and wastrel appearing on his doorstep. Shanti offers to send the money order, but she is in a quandary. How is she going to run the household if she sends the money to her sister? While they are pondering this, Ramesh sees a matrimonial notice in the newspaper - Chanchal and Mr Dayal are married. Shanti is shocked, but Mr Dayal lives just across the street from them, and she and Ramesh see Chanchal in his house. It appears that Chanchal is living her dream. Dayal is a workaholic, but as of now, Chanchal hasn't quite realised what that will mean for her. So she shops her heart out, and even goes to Shanti's house to make her jealous, where Ramesh's cutting words leave unseen wounds. When she returns home, as much to prove to herself that her choice was the right one, she finds her husband engrossed in his files. Try as she might, she cannot take his mind off his work. Chanchal is furious. Especially when she looks over to the neighbouring terrace and sees how happy Shanti is. It cuts her to the quick. Life is not all moonlight and roses for Shanti either. Her sister, Uma (Dulari) has come to visit, wayward husband, Prakash (Yakub) in tow. Prakash is open about his 'needs' - alcohol. He makes no pretence at hiding who or what he is, even though he's in his in-laws' house. Heartbroken at how Prakash treats his daughter, Digambernath attempts to stop him, only to have Prakash shove him hard; the old man falls down in a faint, and this time, his precarious health fails him. Shanti's plight is now even more critical - her father is dead, her sister is ill, and her brother-in-law is making everyone's life miserable. When he uses the last bit of money in the house (Shanti's bangles) to buy alcohol instead of medicine, Shanti has to stop Ramesh from physically assaulting him. Seeing Chanchal's concern when she visits, Shanti confides in her. Encouraged by Chanchal, she also takes up a job at the local theatre. What she doesn't realise is that Chanchal has an ulterior motive in doing so. She first offers Ramesh employment, coaxing her husband to take him on as legal assistant. When Dayal agrees, a happy Ramesh comes home to share the news with Shanti - now they can get married. Things are not that easy, however. Dayal is still a workaholic; only now, he prompts Ramesh to be his wife's companion when he is not around. This is exactly what Chanchal was hoping for, and she takes full advantage of it, much to Ramesh's discomfiture. The closer she tries to get to him, the further he moves away from her. Chanchal is irritated, but she plays her cards close to her chest. It's not that Ramesh is oblivious, but having already taken her measure, he is willing to play the waiting game himself. Meanwhile, Chanchal, who assures Ramesh that she knows how to get her money's worth, runs into Prakash, who tries a spot of genteel blackmailing. Chanchal doesn't care. She's playing her game for keeps; what's a little money? Ramesh's unwilling involvement with Chanchal is beginning to cause problems with Shanti, while Prakash assiduously fans the flames. After causing a minor rift between them, he proceeds to put matters rather plainly to Chanchal. Pay him Rs5000, and he will see that Ramesh is hers. If she wants, he's even willing to murder her husband for her. After all, how long can she continue a clandestine affair? On New Year's Eve, matters come to a head. Dayal and Chanchal have been invited by the Commissioner of Police to a dinner party at his house. Chanchal, egged on by Prakash, has plans of her own, and pretends to be ill so she can get out of going along with her husband. She's not aware that her plans are not as secret as she would have wished. Dayal goes away quietly, and soon after, Chanchal takes Ramesh to a New Year's Eve party at a local club. On the way, she feeds him drug-laced chocolates provided by Prakash. At the party, Prakash also manages to spike Ramesh's soft drink, leading to a humorous (and musical) interlude. There's an unexpected witness to their partying. A disgusted Dayal leaves the club, but not before he's spotted by Prakash. As an intoxicated Ramesh returns home, the rift between him and Shanti widens. Her words cut him to the core, and drunk as he is, he leaves the house, despite Shanti's pleading. Chanchal is waiting outside to take him home, and Shanti watches bereft as they leave together. Back at her house, Chanchal is not aware that her husband is waiting for her. She takes Ramesh upstairs, and it proves the last straw. A humiliated Dayal makes his will leaving all his money away from Chanchal. Prakash, who has followed Dayal home, witnesses this. The next day, Dayal takes Chanchal out and accosts her with her perfidy. He also informs her that she has been disinherited. (For such an astute lawyer, Dayal doesn't seem to have all his ducks in a row.) Despite Chanchal's pleas, Dayal refuses to listen; he will drop her in the city, he tells her, and she can go wherever she wants. Unfortunately, when he returns to the car, both tyres are flat. They are forced to take a boat that is conveniently moored near the river. Suddenly, there is an accident, and Chanchal is left a grieving widow. A rich, grieving widow. Operative word, 'rich'. Turns out that Prakash is the one who murdered Dayal; unfortunately for Chanchal, he has Dayal's will. So she pays, willingly. And he takes, willingly. Meanwhile, Ramesh is still angry that Shanti misjudged him (or so he feels), and more so that she never came to coax him out of his sulks. Jagat has no time for such nonsense. He tells Ramesh off, going so far as to accuse him to forgetting Shanti now that Chanchal has come along. But Chanchal and Prakash are finding out that crime makes for the strangest bedfellows. Neither trusts the other; what will happen when Chanchal decides to take matters into her own hands? Prakash is as clever as he is crooked. Will she be able to outwit him? Or since Shanti has overheard their guilty secret, can Chanchal sit back and let matters take their own course? I have quite a bit of tolerance for plot holes. At least, with eye candy like Dev Anand and an absolutely luminous Nutan (she must have been in her early 20s then), and even a spunky Shubha Khote in a rather daring (for those times) negative role, the film, with all its flaws was mostly fun to watch. 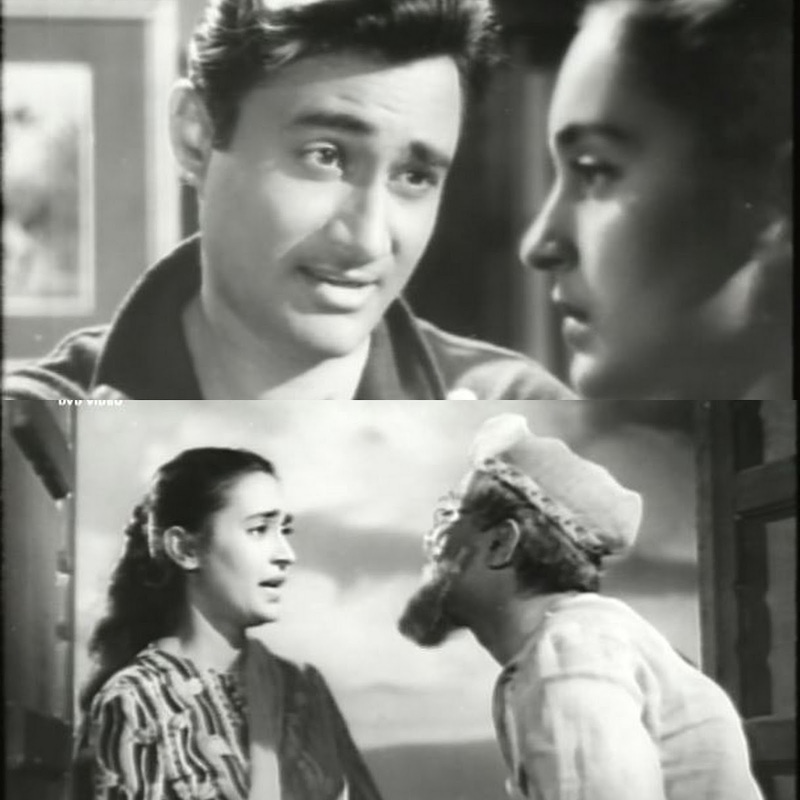 A vintage Nasir Hussain romance (he wrote the screenplay and dialogues), Paying Guest had his usual tropes: boy meets girl, they fight, girl gets better of the boy, boy manages to inveigle himself into her good graces, they fall in love, enter deux ex machina, hearts are torn apart, then true love triumphs, misunderstandings are cleared up, and they live happily ever after. 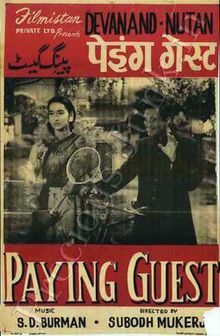 In Paying Guest, he decided to add a soupçon of murder as well; like Baat Ek Raat Ki earlier, the heroine stands accused of murder and her lover, a lawyer, has to prove her innocence. Dev Anand plays Ramesh with an innocent goodness – with his gap-toothed grin and laid back charm, he was the perfect lover. When he croons Toota phoota dil hai hamara, jaisa bhi hai ab hai tumhara… how can any girl resist? (Even if it is a stalking song? I like that Shanti doesn't fall in love with him at the end of the song, though. That takes time, and I like that it is the caring side of him that makes her change her mind, even if she is attracted to him before.) Only Dev could ride a cycle in an achkan and make it look so casual. His interactions with Nutan, gave us some of the finest comic scenes in a run-of-the-mill romance – when he first meets Nutan, it is because he's disturbed by her dancing; he mutters Ye zaroor koi kali si moti bhains type ki ladki mere sar ke upar kood rahi hain. Nutan gives him as good as she gets – Badmash, gunda, lafanga, she throws at him; ‘Ji, woh teeno yahan nahin rehte,’ he retorts. He's also perfect as the old man, Mirza Saheb, with his bent gait and high-pitched quaver. Despite dissolving into mush every time Dev appeared on screen, there was one time when I couldn’t take my eyes off Nutan – the picturisation of O nigahein mastana… Nutan looked incredibly gorgeous in this scene, and Asha’s humming (the verses are all by Kishore) added that additional zing to a wonderful melody. Like in all other movies where the pair starred together, they have an easy rapport going on; they look so thoroughly comfortable with each other that the scenes between them, even the ones where they are squabbling, work so well. This was also Shubha Khote’s film – one in which she got to do a bit more than was her usual due. She had quite a lengthy role, and she did full justice to it – from being an ambitious, if self-serving young girl, to a young wife who realises that all that glitters is not quite gold, and that the grass is sometimes definitely greener on the other side, to a woman who, when faced with disaster, is not above saving her own skin, consequences be damned. Yakub is the consummate villain, unapologetically villainish, without descending into caricature. Prakash plays both ends against the middle, making it clear, especially to Chanchal, that the only ends he serves are his. If, by doing so, he can help Chanchal attain her goals, that's the icing on the cake. He worships only one god, Mammon. In that, he and Chanchal are exactly alike, only he's more honest about his intentions than she is. You cannot mention Paying Guest, and not talk about its songs. SD Burman’s compositions were the added gloss, from the teasing Mana janab ne pukara nahin to the despairing Chand phir nikla, the wonderful O nigahein mastana to the playful Chhod do aanchal zamana kya kahega... particular favourites being Chand phir nikla and O nighahein mastana. In all, this was a film that was lifted out of the doldrums by its leads. And its music. What it needed was better writing and direction. But if you need an afternoon of harmless entertainment, and you are not too questioning of gaping plot holes, then Paying Guest is a good way to spend a couple of hours. 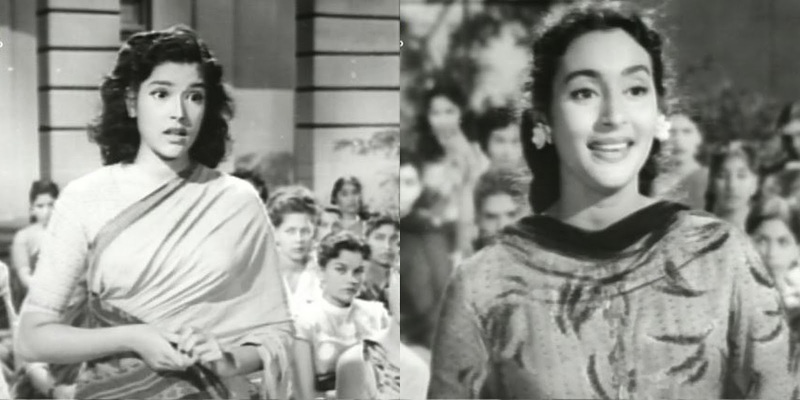 Dev and Nutan and their romance, and the songs make you, if not forget, at least not mind that there are flaws.